Organisations with fewer women in senior roles are losing out on the widest range of talent available to them, according to Fórsa president Ann McGee. She said organisations must not overlook the people with talent, ability and experience available to them, and told delegates that they can, and should, all strive to be leaders. 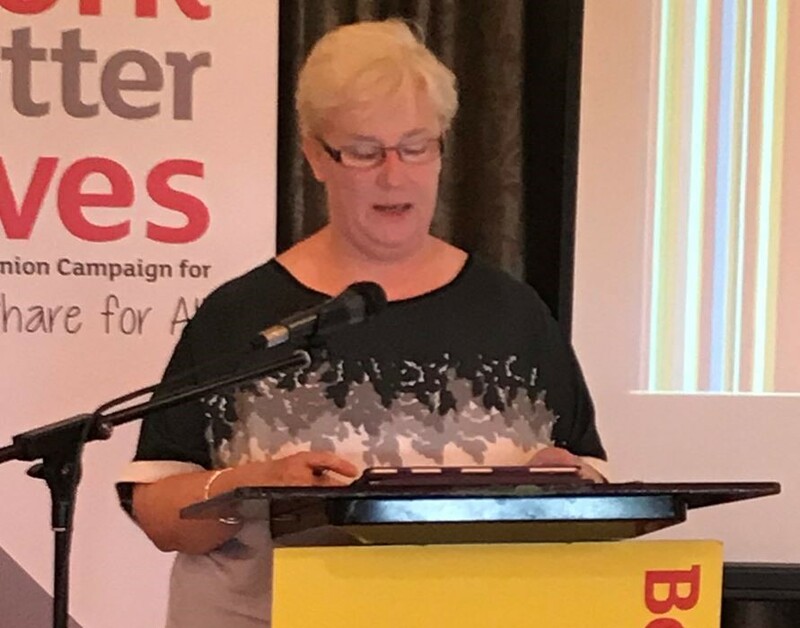 Ann was speaking at the Irish Congress of Trade Union’s (ICTU) biennial women’s conference today (Thursday 14th June) which is taking place at the Killyhevlin Hotel in Enniskillen, Fermanagh. Institutions that are more diverse are better able to respond to the needs of everyone in society and provide services that are more in tune with the public. Ann was proposing a motion on the representation of women in public life. She said institutions that are more diverse are better able to respond to the needs of everyone in society and provide services that are more in tune with the public. “The barriers to women’s representation are often referred to as the ‘five Cs’: care, cash, confidence, culture, and candidate selection.” Ann said a lot of existing research backs the need for measures such as flexible, family-friendly working hours for both women and men, and that these kinds of policies would help to overcome some of the existing barriers to women wishing to take on more senior roles. Ann also called for the implementation of policies to ensure more gender equality in caring, including state-subsidised childcare. She said this was especially needed for early years childcare, in addition to subsidised quality after-school care. The causes are more wide-ranging. Women often don’t feel supported or encouraged to participate, and personal confidence can be identified as a major obstacle to women. Ann said that the barriers are not exclusively related to caring responsibilities. “The causes are more wide-ranging. Women often don’t feel supported or encouraged to participate, and personal confidence can be identified as a major obstacle to women,” she said. “It’s essential to involve women in public life to take advantage of their contribution, to ensure their interests are protected and to fulfil the guarantee that the enjoyment of human rights is for all people regardless of gender. Women’s full participation is essential not only for their empowerment but also for the advancement of society as a whole,” she said. Ann called upon Congress and all affiliated unions to encourage the promotion of more women activists and officials. “Our determination to succeed is strong enough, so let there be no obstacles or barriers to women securing positions of leadership in our movement. I stand here today as an example that today’s accomplishments were yesterday’s impossibilities,” she said.